DO-10450-31 was succesfully added to your cart. monitoring up to eight distinct zones. Order sensors separately. The easy-to-use LCD console displays the current conditions and the high and low limits in each zone. Scan automatically or manually through all the active zones. All models have a programmable alarm per zone with a delay of up to 120 minutes to avoid nuisance alarms caused by common events. If a zone deviates from the preset limits, the console will display the event and send a signal to an optional external device such as an alarm panel or dialer. Programming is retained in memory if power is lost and settings can be locked to avoid tampering. White ABS plastic console can be surface mounted or order an optional gang box. Eight-Zone Console can monitor up to eight distinctive zones and has datalogging capability. 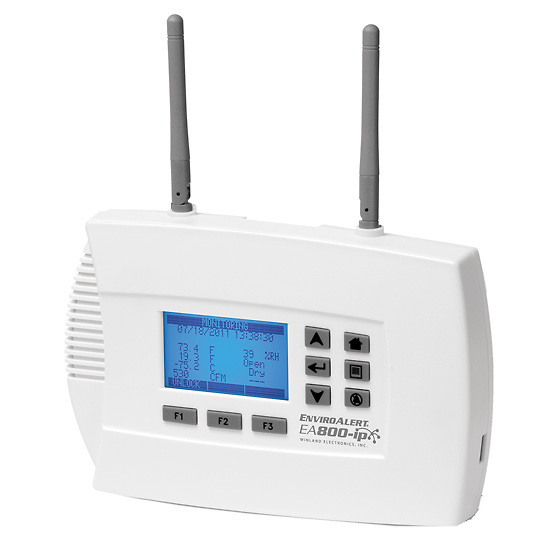 Connect any combination of up to four wireless and up to four hard-wired sensors to monitor temperature, humidity, or water. Wireless sensors provide a solution where hard wire installation is impractical and can be located up to 1000 feet (305 meters) line-of-sight from the console; operate on either two AA batteries or 12 VDC line power. This unit also accommodates the ultralow temperature sensor for monitoring cryogenic applications. Console store up to 9000 data points that can be downloaded via an USB interface. Logging can be set from 30 seconds to one hour. Software is included to display and manage logged data. Unit has eight configurable and one nonconfigurable output relays, and can be customized to accept nonproprietary 4 to 20 mA sensors.